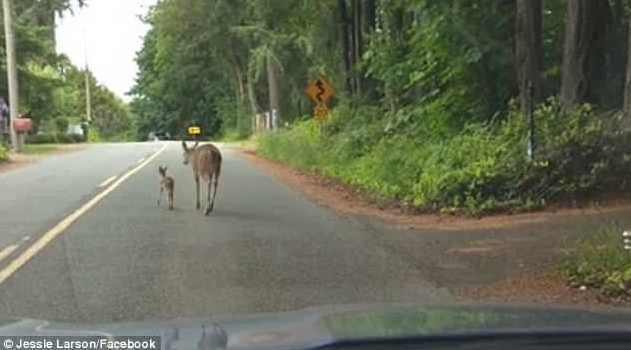 A mother deer came to the rescue of her fawn who appeared stuck in the middle of a highway in Washington state. The fawn appears to be frozen in fear as the mother comes over to nudge her to safety. A driver uploaded video on Instagram on Sunday showing a doe walking toward her fawn on a highway in Port Orchard. When the mother found her offspring, she approached it as it was lying down on its stomach. The fawn is then seen being nudged to move off the highway. The adorable video generated close to 200,000 views on Instagram as of Sunday night. Jessie Larson was overjoyed to be there to capture the moment on video. Larson, a local resident, was driving on Baby Doll Road in Port Orchard when she came upon the scene. The pair eventually made their way off the road and into some nearby bushes. She turned her car engine off, she said, so the fawn’s mother wouldn’t be scared off. 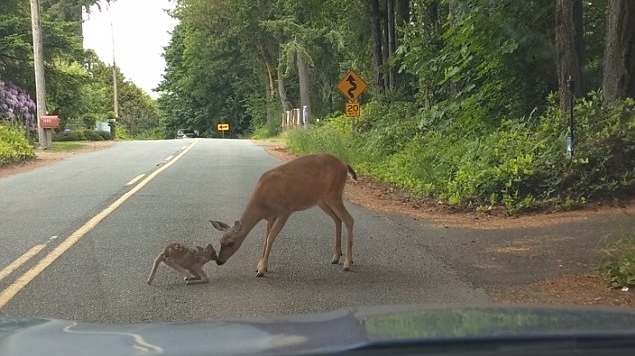 Responses to "Mama Deer Rescues Fawn Frozen In Fear On Road "